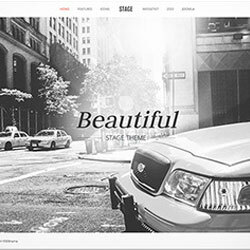 Stage provides an optional framed page layout to give your website a very sophisticated look, emphasized through the use of elegant typography. If the frame is turned off, the navbar will remain fixed to the top of the page with the logo centered between the menu items. Three fullscreen positions for background images as well as the option to extend other positions to fill the entire viewport give your content plenty of space. Additionally, you can apply three different background colors to these sections. The blog styling offers a lot of flexibility, allowing you to center content and to box articles. These styles can be combined as you like and be assigned to different layouts.